Tracks have been grouped, colored, and routed to appropriate submasters. FX sends and returns have been created. Typical channel strip plug-ins have been inserted (appropriate to the instrument), but no settings are enabled. The master fader includes metering plug-ins. The intended purpose is to speed up your workflow by taking care of the setup/housekeeping step in the mixing process, so that you can start the creative flow sooner. Feel free to replace the Avid/Digidesign plug-ins with your favorites. Leave the settings flat or bypassed so there in nothing affecting the sound initially. If you have a session already in progress (i.e. from a recording session), you can import the tracks from the template using the Import -> Session Data command in the File menu. You can then move the audio clips onto the appropriate tracks. If you are given raw stems to mix, you can save the template using the Save As Template command in the File menu. (The template file will be saved in your applications folder.) The next time you create a new session, choose Create New Session from Template, and you’ll find the template there. You can then import the raw stems into your session on the appropriate tracks. These plug-ins can be purchased as part of an effects bundle. This plug-in can be purchased as part of a larger bundle. This plug-in can be purchased as part of a larger bundle, and it is the entry-level version of the TSAR-1 plug-in. Arguably the best included reverb plug-in of any DAW. It is definitely more cost effective to buy these as part of bundle, however all three are not part of the same bundle until Gold. This plug-in is more cost effective as part of a bundle. There are many UAD reverb plug-ins, ranging in price from $149 to $349. All require UAD-2 hardware. All of these plug-ins can be demoed before purchasing. So, take advantage of this to avoid buyer’s remorse. Keep your credit clean. Retailers like Sweetwater or Musician’s Friend offer 0% interest financing for periods of time to serious buyers. Suddenly, a plug-in bundle costing $500 dollars becomes a more manageable $21/month payment. Follow a company whose products you are interested in buying. Many companies put items on sale for a very short time and only announce the sale with a tweet or a post. As a student, you can get an educational discount on most software, including plug-ins (usually 50% off). Take advantage of this while you still can. During mixing, it is recommended that you leave the master fader alone, and avoid using any processing on the stereo bus. It’s mixing then mastering; don’t try to do both at the same time. However, the master meter is still critical when mixing. Look at the meter often. Treat it the same way you would an input level during recording; strive for a good, strong level but avoid clipping. There should be several plugins on your master channel; all to assist you in the mixing process. The view of the meter in the DAW is relatively small. Increase the view with a plugin like the Massey High-Resolution Meter. Dynamic range is the difference between the loudest and the softest values of the audio. The TT Dynamic Range Meter is a large meter that also displays dynamic range and RMS values. An LED meter displays peak values useful for recording and preventing clipping. However, slower meters, like a VU meter, display average levels which are more representative of perceptual loudness. The Pro Tools PhaseScope plugin includes an RMS meter. 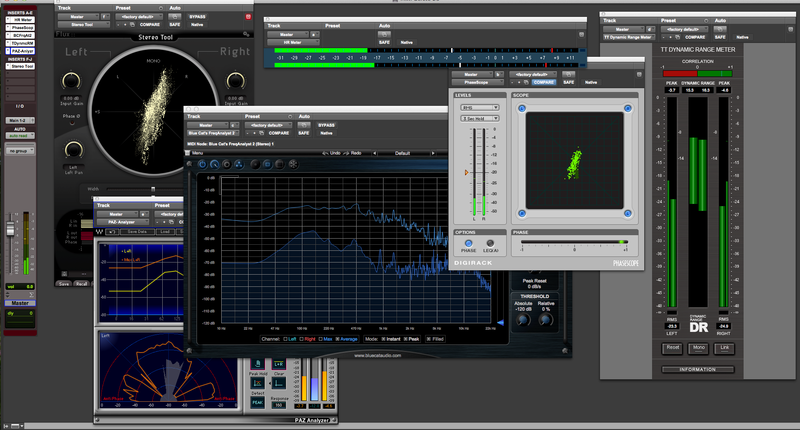 Both the Massey High-Resolution Meter and the TT Dynamic Range Meter show RMS as well as several plugins from Waves. A spectrum analyzer displays the spectral content of your mix, which can help identify problems. Examples include Blue Cat Audio FreqAnalyst and Waves PAZ Analyzer. A meter that displays the phase relationship of a stereo signal (i.e. left v. right). The Pro Tools PhaseScope plugin includes a correlation meter as well as the TT Dynamic Range Meter and the Flux Stereo Tool. The Producers and Engineers Wing (P&E Wing) is a part of the academy made up of producers, engineers, mixers, and other technically involved professionals. A regional music industry not-for-profit organization based in Washington, D.C..
Activity centers around highlighting the area’s cultural contribution by assisting regional musicians with becoming recognized on a national scale. The organization offers its members a variety of professional development services, including seminars, directories for networking, assistance with obtaining barcodes for recordings, and the production of live music events. A non-profit organization to benefit aspiring and professional songwriters. Provides intermediary functions, particularly collection of royalties, between copyright holders and parties who wish to use copyrighted works publicly in locations such as shopping and dining venues. A trade organization that represents recording industry distributors in the United States. Its members consist of record labels and distributors. RIAA has its headquarters in Washington, D.C.
An international professional association, based in the United States of America, of engineers working in the motion imaging industries. An international scientific society dedicated to increasing and diffusing the knowledge of acoustics and its practical applications. The following is a guide through the mixing process. It’s not the only way to mix, but if you’re having trouble getting started, this could help you. 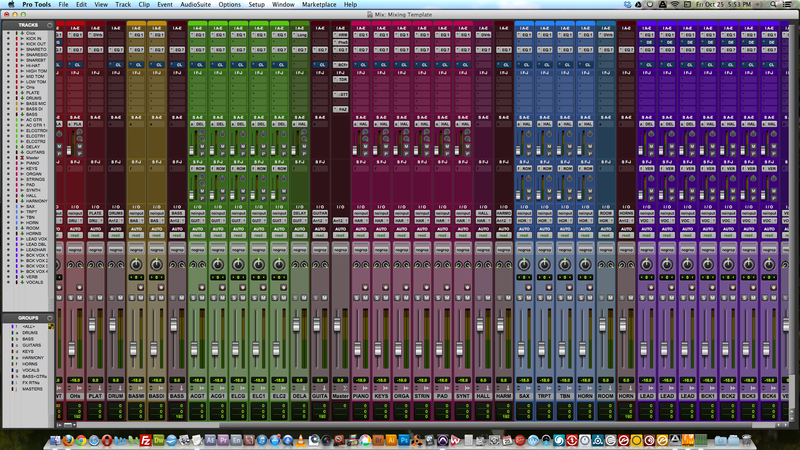 Mixing is an individualized process; what ever works for you is the right way to go about it. But, at some point it will be a good idea to write down your plan so that you can mix efficiently. The following is what I do currently, but it’s always evolving. Drums on left. Vocals and Masters on right. The most important instruments are the loudest, but not by much. Everything should be heard; nothing should get lost.